I think you are on the ground floor of a major movement that is going to help men, women, organizations, and society! (rights, treatment, safety, etc.). These are both patently important foundational elements. We believe partnership goes beyond equity and equality to create powerful synergies by leveraging differing competencies. No matter where you are on your journey as an ally, a leader, or an organization, we have workshops, training programs and tool sets for you to use to reach new levels of inclusion. These are some of the events and programming we provide. We create scalable, sustainable, and measurable solutions to drive fundamental cultural change for Fortune 500 companies.We use a combination of executive coaching, strategic consulting, and interactive training to produce action-oriented, results-driven change initiatives. 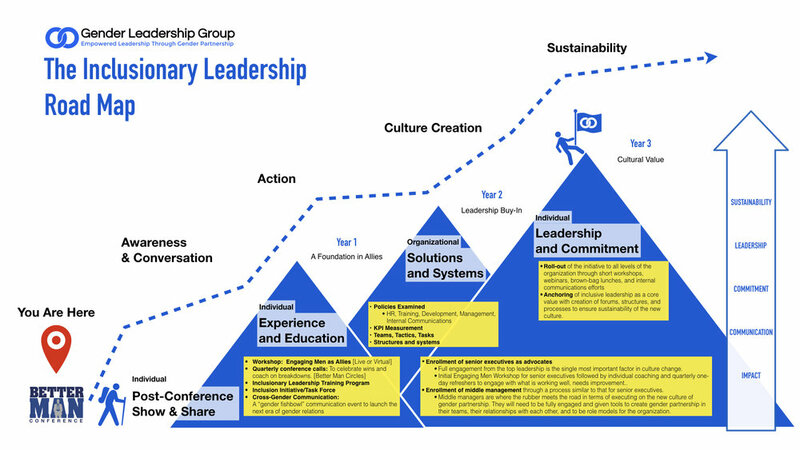 Inclusionary Leadership Group is a collaboration of inclusionary leadership professionals who stand for women and men in full partnership in organizations and in our communities. We have built an advisory board that we call "the Inclusionary Leadership Allies Council" with professionals and colleagues we trust to offer intersectional perspectives to be sure we do informed work, and so we can be sure we are also staying in our lane to do our work. We encourage our clients to work with our partner organizations, such as UN Women, Lean In, and Catalyst whenever their work is most appropriate. We call this integrity, and we live by it. Find out about our game-changing conference. The first of its kind to engage men as allies in inclusionary leadership. In 2017 we reached 1.45 million people with more than 15 million impressions. Our sponsors were PwC, Kaiser Permanente, Blue Shield of California, the ManKind Project, HP, eBay, Thomson Reuters, and Chevron among many other attending corporate delegations. We are thought leaders in the fields of gender/masculinities, inclusionary leadership, and organizational transformation. Start engaging men in full gender partnership today with this guide, and click the button below to schedule time with us to go deeper.